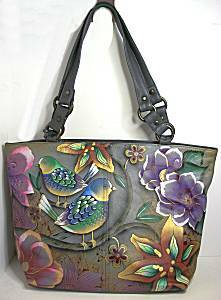 This page features handbags with shoulder straps, one of the more popular styles as ladies can keep their hands free while carrying one. The strap length can be high-shoulder (worn with bag nestled under the upper arm), or long (bag rests at the hips). However, many of these offer optional shorter strap options, check the item description carefully! 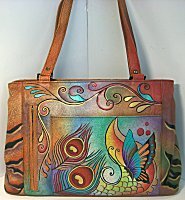 So many possible styles in our inventory of handbags and accessories, try also Search or Style & Functions links to left. 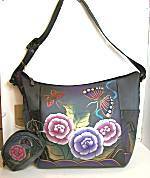 Also note, there may be items in this style in our Handbags Outlet. Yummy soft and lightweight (until you fill it). 8-1/2 x 5 inches, expandable width. Full metal zipper top. Inside is lined with compartments. There are 2 larger section on both outer sides. Interior has 2 smaller open compartments, each with 3 credit card slots. At very center is smaller zip compartment. Comes with detachable and adjustable straps...so use this as a clutch, or smaller bag inside your tote, cross-body, or shoulder, wristlet too! 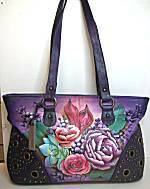 Yummy soft faux leather bag is 10 x 7-1/2 inches, expandable for personal items. Comes with 2 detachable straps. One is elegant 18 inches for high shoulder wearing, that has goldtone chain and comfortable top; the other is longer without chain for shoulder/crossbody. And then you can use none for clutch use! On the back is zipper pocket. Flap closes over front with 2 magnetic snaps. Inside is compartmented with 2 full zipper pockets and open pocket between them. REVERSIBLE! Messenger shape measures 12-1/2 x 9 x 3 inches...yes large enough for business paperwork. As shown, the buttery soft turquoise blue leather outside has a large open pocket in back, then under the flap is a full zip top, with unlined suede interior and 2 open pockets. There is also an open pocket IN the flap. To reverse to black leather showing, Flip the Flap and you have the zip top revealed, covering the open pockets now under the flap. Either way, 1 inch wide comfortable shoulder strap adjusts for shoulder or cross-body carrying. This bag is designed to make excellent use of space and hold lots of personal items, while organizing them! Measures 12 x 6-1/2 x 4 inches, in soft pebble texture leather that is dyed a banana yellow. On both ends are cell phone sized pockets with flap covers that close with snaps. On the back is a zip pocket. On top, are two zippers with pull tabs, to open each of two compartments! Both compartments are lined in gold fabric. One has a cell phone pocket. The other has a small zip pocket, and detachable key chain holder. The 24 inch shoulder strap of the same leather is attached to bag in clean upward lines at sides. This bag is designed to make excellent use of space and hold lots of personal items, while organizing them! Measures 12 x 6-1/2 x 4 inches, in soft pebble texture leather that is dyed rich black. On both ends are cell phone sized pockets with flap covers that close with snaps. On the back is a zip pocket. On top, are two zippers with pull tabs, to open each of two compartments! Both compartments are lined in gold fabric. One has a cell phone pocket. The other has a small zip pocket, and detachable key chain holder. The 24 inch shoulder strap of the same leather is attached to bag in clean upward lines at sides. 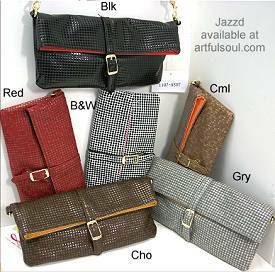 Ideal larger bag, as it can be slender/flat when you do not have a lot of personal items inside. But plenty of room to fill it full! Measures 15 x 3-1/2 inches at the bottom, 12 inches tall and 13-1/2 inches across the top. Made in yummy soft pebble texture leather dyed a dark java/espresso brown. This bag features lots of organization, as there are 3 separate full-size zipper sections, one at the center with inset zipper, and one on each side where it appears that there are open pockets (but they zip if you want!). On front is a smaller open patch pocket, and on the back is a small zipper pocket. The interiors are lined in neutral light fabric. The large center section has cell phone pocket, 3 pen/pencil holders, and small zip pocket. Dual 28 inch long shoulder straps are a comfortable width, tapering from wide to narrower toward top. Sleek and stylish but with room for your stuff, yummy soft pebble leather constructions, dyed a medium-bright tangerine orange color. Measures 8 inches across bottom, flares out to 14 inches toward top, 2 inches deep. Outside has a large inset zip pocket. Full zip top has dual zipper pulls. Interior lined in tan fabric with zip pocket, cell phone pocket, and 3 pen holders. 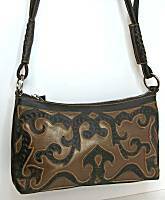 Shoulder strap adjusts in length with goldtone buckle. Large zip top tote style bag, perfect for daytime and stylish work. 15 x 12 x 4-1/2 inches, soft textured faux leather, the top is amethyst purple, the bottom in light periwinkle blue, separated by a gold metallic zipper on both back and front (non-functional). The front has an additional zippered pocket, 7-8 inches deep, 5-1/2 inches across for handy items. Inset full zip top opens to beautiful white lining with black floral print (light color easy to spot items at the bottom). It has 2 open pockets and small zipper pocket to organize. Dual 26 inch shoulder straps, flat and comfy at 5/8 inch wide. And to top it all off, this bag weighs less than 1-1/2 pounds! VERY HANDY, you might want ALL the colorways for yourself or as gifts! Made with durable synthetic leather, the finish has raised check texture and gloss. Folded, measures 8-1/2 x 4 x 1 inch, unfloded it is 8-1/2 x 6-1/2 inches. Closes with magnetic snap under faux buckle, and another hidden magnetic snap closes the open top. 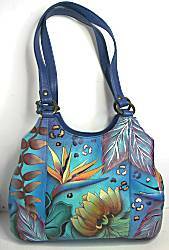 Interior lined in a colorful solid fabric with zipper pocket. Each comes with detachable 22 inch shoulder strap, 1/2 inch wide made with same faux leather. Choice of Red (deep cranberry), Black&White, Black, Gray (medium/light), Chocolate (dark espresso brown) and Camel (light golden brown). Evening style little bag measures 6-1/2 x 5 inches. The fabric has satin shine with a high-low texture that almost looks like stripes. Front and back is covered in 3 rows of pleats, and a folded flat bow at the top. Zipper top, interior lined in black with white polka dots fabric. The zipper pull has a piece of that lining tied to it, but you can remove if you like. Long shoulder chain, silver on the Silver (almost pewter) bag, and gold on the Black and Gold (light gold) bags. Reinforced fabric handbag measures 10 x 9-1/2 x 4 inches. Burgundy wine solid woven fabric is covered by intricate embroidered patterns in natural ecru thread. "Selalu" means "Always" in the language spoken by the Banda Aceh villager who made this bag. It features 4 chrome peg feet to protect the bottom. Bag is divided into 2 compartments, each with inset zipper top. Interior lined in burgundy color satin, one side has cell phone pocket, the other a smaller zip pocket. Dual 29 inch shoulder straps attached to bag with chrome hardware. Reinforced fabric handbag measures 10 x 9-1/2 x 4 inches. Navy blue solid woven fabric is covered by intricate embroidered patterns in natural ecru thread. "Selalu" means "Always" in the language spoken by the Banda Aceh villager who made this bag. It features 4 chrome peg feet to protect the bottom. Bag is divided into 2 compartments, each with inset zipper top. Interior lined in navy color satin, one side has cell phone pocket, the other a smaller zip pocket. Dual 29 inch shoulder straps attached to bag with chrome hardware. This has more features than immediately meet the eye! Measures 14 x 7 x 4 inches. 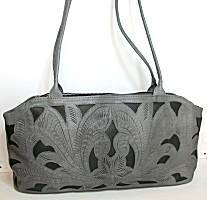 The silver-gray leather on top has tooled patterns, cutout to reveal the dark gray leather underneath. Topstitch detailing. Both front and back have a large open compartment that is closed simply with a snap, each lined in black/gold scrolling fabric. Full zip top over the larger center compartment, that has the same lining. Interior has 2 zipper pockets, a cell phone pocket, and 3 slots for credit card/ID items. Dual 28 inch shoulder straps are leather-wrapped cord, very soft and flexible. 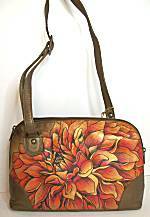 This small bag is a fabulous find with its range of brown. Dark espresso/walnut on top with tooled patterns, has cutouts to reveal the smooth metallic dark bronze/copper underneath. Offwhite topstitch details emphasize the scrolls and add yet another neutral to the mix. Bag measures 9-1/2 x 6 x 2 inches, has a full zip top. Interior lined in signature black/gold scroll fabric with a small zip pocket. 24 inch shoulder strap for high shoulder wearing has double folded cords, captured to bag with chrome hardware and wrapped whipstitch detail.